The debate around Learning Analytics seems to be opening up. And although there is little sign of agreement over future directions, the terms of discussion seem both broader and more nuanced than previously. I think some of this is in response to the disillusionment of early researchers and adopters. In yesterdays OLDaily, Stephen Downes pointed to an excellent article by Bodong Chen. Bodong points to the surge of interest in Learning Analytics but cautions that: “The surge of this nascent field rests on a promise–and also a premise–that digital traces of learning could be turned into actionable knowledge to promote learning and teaching. Understanding and accepting that “the meaning of learning analytics as a term is plural and multifaceted” is an important basis for future research. Within the only just emerging field of workplace Learning Analytics, not only is there the issue of individual and collaborative learning and knowledge development but also issues around proxies for learning. Whilst performance in practice might be seen as a possible proxy, performance may also be seen to involve a wider range of factors, including the working environment, the division of work and opportunities for practice. And the already established field of Performance Analytics seems at considerable tension to learning. I found yesterdays protests about the BBC plans to archive their recipe site fascinating. After over 120000 people signed a petition protesting against the move and after the government culture minister (somewhat disingenuously) distanced himself from the plan, the BBC backed down and said they would move the recipes to their commercial web site. Now those into conspiracy theory might suggest this was what the BBC were after all the time and others point to huge protests from the middle class over the potential restriction on access to the Great British Bake off etc. whilst cutbacks to welfare quietly proceed. But I think this misses the point. The major pressures for the BBC to restrict access to free recipes was that they are competing with private businesses including paid for newspapers, subscription websites, commercial publishers and so on. And that public funding should not be allowed to so this. People didn’t buy in to that argument, largely because of a conciousness that the BBC is a publicly owned organisation and that we have teh right to free content paid for by a license fee (ie taxes). I seem to remember the same argument coming from publishers in the early days – some ten or twelve years ago – against Open Educational Resources. Resources created by university staff, so they said, were paid for by public funding and that was unfair competition. Today despite the government’s same disdain for publicly funded education as for the BBC, Open Educational Resources have become seen as a Good Thing. And the debate over OERs has extended into a wider discussion on the meaning of open. In the same way the protests over the proposed archiving of a publicly owned archive of recipes could well extend into the meaning of open content in wider areas of the web and to an open digital infrastructure The battle for open goes on. Another in this mini series on Learning Analytics. 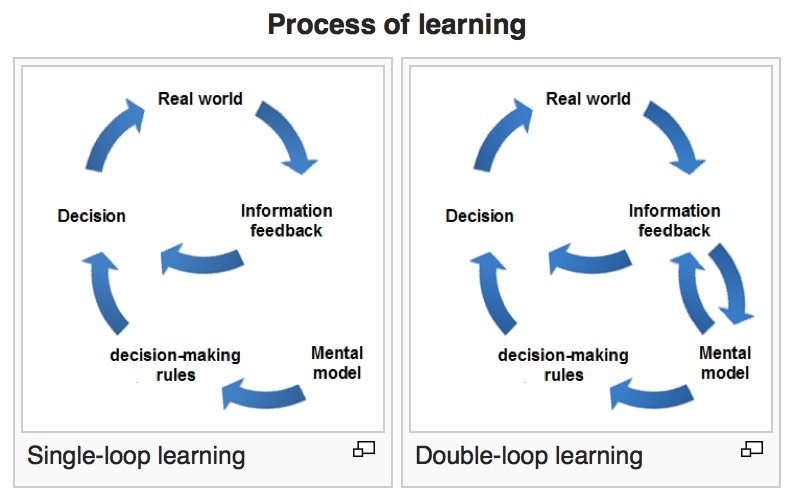 When looking at Work based learning, Double Loop Learning becomes particularly important. 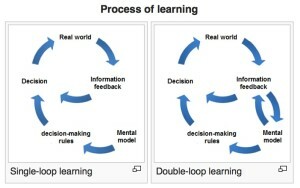 Double-loop learning is used when it is necessary to change the mental model on which a decision depends. Unlike single loops, this model includes a shift in understanding, from simple and static to broader and more dynamic, such as taking into account the changes in the surroundings and the need for expression changes in mental models. ( Mildeova, S., Vojtko V. ,2003 ). To remind readers again, in the EmployID European project we are aiming to support scalable and cost-effective facilitation of professional identity transformation in public employment services. And I would argue such identity transformation is based on refection on learning, on Double Loop Learning. 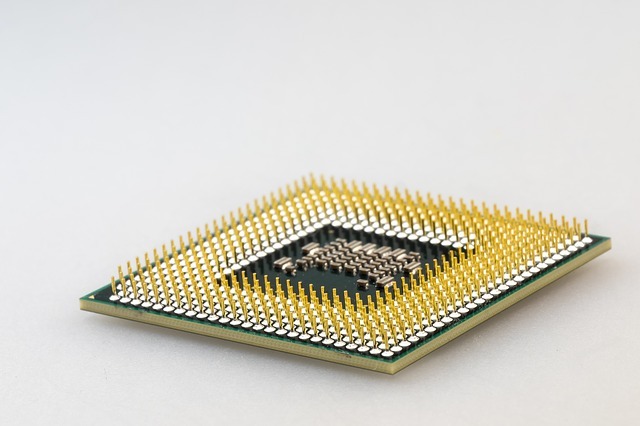 Identity transformation necessarily involves the development of new metal models and new ways of looking at work based behaviours and practices. So where does Learning Analytics fit into this? 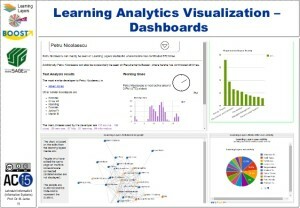 Learning analytics aims to understand and improve learning and the learning environment. This does not necessarily involve Double Loop Learning. For students feedback about their present performance may be enough. But if we aim for identity transformation and wish to improve the learning environment then we need a deeper interpretation of data. This has a number of implications in terms of designing Learning Analytics. Firstly we have to have a very clear focus on what the purpose of the Learning Analytics is. Is it to find out more for example about informal learning in organisations or to inform L and D department staff about the Learning environment. Is it to help learners understand about their interactions with other staff or to examine their own dispositions for learning – and so on? Secondly – and crucially who is that data presented to users – be it learners or trainers. 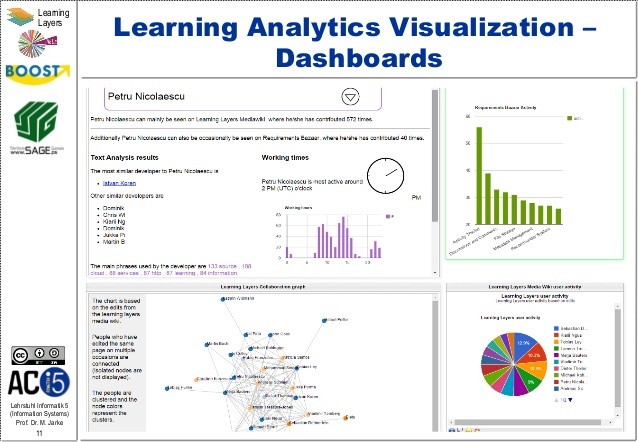 The existing parading for Learning Analytics presentations appears to be the dashboard. Yet in the LAk16 pre conference workshops there were a whole series of presentations where presenters invited participants to say what the graphics meant. And often we couldn’t. If LA professionals cannot interpret data visualisations then a leaner has little hope of making their own meanings. I am a little puzzled as to why dashboards have become the norm. And one of my major concern is that often it is difficult to understand the visualisation out of the context in which the learning exchange has happened. If Double Loop learning is to happen, then learners need to reflect in order to make meanings. And refection occurs best, I think, in the context in which it takes place. There are alternatives to the dashboard. For instance with EmployID we are developing real time discourse analysis and are also looking at providing dynamic prompts for reflection.>One final point. If we are aiming at using Learning Analytics for Double Loop Learning we need to find out what works and what does not. That means that any measure for Learning Analytics needs to be accompanied by well designed evaluation measures. All too often because LA collects data, it presumes to cover evaluation. Whilst both LA and evaluation may share data, they aim at different things. I’ve been spending a lot of time thinking about Learning Analytics lately and this is the first of four or five short posts on the subject. Its all been kicked off by attending the Society of Learning Analytics pre conference workshops last week – LAK16 – in Edinburgh. Sadly I couldn’t afford the time and money to go to both the workshops and the full conference but many of the presentations and papers from the conference are already viable online. My interest in Learning Analytics stems from the EmployID project which is aiming to support scalable and cost-effective facilitation of professional identity transformation in public employment services. And in our project application under the EU Research Framework (Horizon 2020) we said we would research and develop Learning Analytics services for staff in Public Employment Services. Easier said than done! An early literature review revealed that despite present high levels of interest (hype?) in Learning Analytics in formal education there has been very little research and development in Workplace Learning Analytics: therefore my excitement at a workshop on this subject at LAK16. But sadly despite the conference selling out with 400 attendees, we only had four papers submitted for the workshop and just 11 attendees. What this did allow was a lot of in-depth discussion, which has left me plenty of issues to think about. And of course one of the issues we discussed was why there is apparently so little interest in Workplace Learning Analytics. It was pointed out that there have been a number of work oriented presentations in previous LAK conferences but these had remained isolated with no real follow up and with no overall community emerging. There was also a general feeling that the Learning Analytics community was weak in terms of learning theory and pedagogy, both of which were censored central to Workplace Learning Analytics. But perhaps most importantly Learning Analytics approaches in schools and Higher Education lean heavily on proxies for learning, for instance examination results and grades. With the lack of such proxies for learning in the workplace, Learning Analytics has to focus on real learning – usually in the absence of a Learning Management System. And that is simply very hard to design and develop.Yet having said that, most if not all of us in the workshop were convinced that the real future of Learning Analytics in in the workplace, with a focus on understanding learning including informal learning and improving both learning and the environment in which it occurs. We agreed on some modest next steps and will be launching a LinkedIn Group in the near future. In the meantime the papers and presentation from the workshop can be found at http://learning-layers.eu/laforwork/.